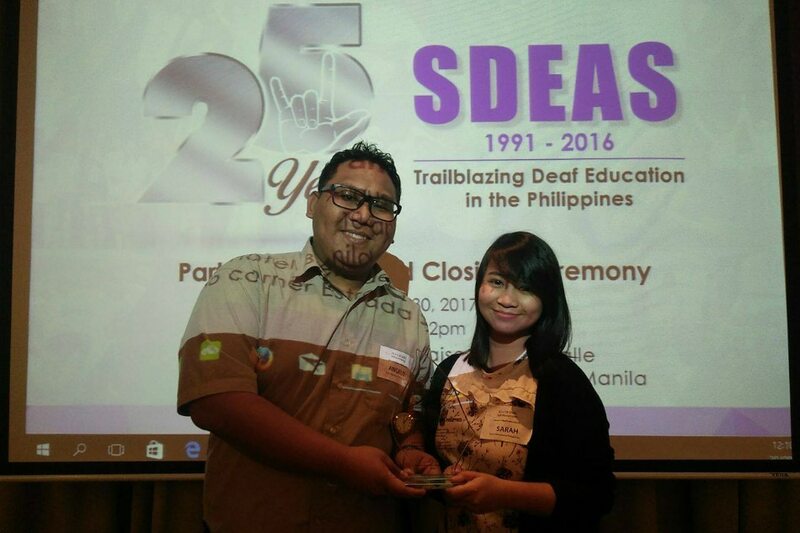 TELUS International Philippines recently received recognition for its efforts to provide job opportunities for two deaf graduates. The Award of Appreciation is given to partners of De La Salle-College of Saint Benilde School of Deaf Education and Applied Studies (DLSU-CSB SDEAS) in the areas of employment, community, advocacy, and access & program development. A few months ago, TELUS International Philippines, one of the pioneers and leading companies in the local business process outsourcing industry, welcomed two deaf employees from the DLSU-CSB SDEAS. Diversity and inclusiveness are central to TELUS International Philippines’ caring company culture, and the addition of the two new employees is very much aligned with their thrust towards providing equal employment opportunities and fostering a widely diverse pool of talents. The new TELUS International team members were welcomed into the company’s IT Outsourcing team, a field where skilled manpower is very much in demand at the moment. Just like any other job seeker, the two went on a series of interviews. However, unlike usual job interviews, their hiring process advanced with the aid of a professional interpreter, who had to undergo two weeks of immersion in TELUS International Philippines’ IT operations to become familiar with the work, skills and culture that the positions required. After passing the interviews and pre-employment tests, the newly hired team members kicked off their full time IT careers with TELUS International Philippines by going through the on-boarding and training processes with the company. In the Philippines, it’s easy to recognize how differently-abled persons struggle with their everyday living. A shortage of public utilities and services available for them is one reason. But finding job opportunities is a crisis they also have to battle, as they compete for employment with the increasing population of unemployed and underemployed Filipinos. In line with this, TELUS International Philippines continues to improve it’s employment program to make it as inclusive as possible, and one way of doing that is by ensuring the process is friendly and accessible to persons with disabilities. Beyond attracting talent, TELUS International Philippines has also been hard at work ensuring that they are able to retain them by conducting regular workshops to help make sure the new team members feel comfortable and properly supported at work. Some of the classes and workshops include basic signs (e.g. greetings), deaf culture, communication strategies and working techniques with deaf team members, and the Philippine and global laws on disabilities. All workshop sessions are open to all TELUS International Philippines employees, but they have been specifically offered to support groups to guarantee that the deaf team members have someone to seek assistance from for any need at work. As of now, TELUS International Philippines’ ITO team has partnered with DLSU-CSB SDEAS in conducting deaf awareness workshops for their team members. To know more about TELUS International Philippines, visit their website at www.telusinternational.com.ph.